Whee!! My Memebox Brightening Care showed up today. I'd totally given up on tracking it since it seemed to be taking it's time getting here so when it was dropped off on my porch, I didn't even know which one it was. That's probably bad, too, huh? Not knowing which Memebox it is... Well, there's more out there and they'll get here eventually! I had seen the spoilers for this box but wasn't sure if I was really going to love everything or not. The Cleosis product was the one I was the most doubtful of. This box was a Memebox Special and was $23. I don't think I paid that much for it, though. Let me check. "Makeup is not the whole truth. Before you can even consider choosing the perfect foundation or tackling those pesky hyperpigmented dark spots, you need to address how to even out and brighten up your complexion not matter what your skin color. So, learn the insider secrets to the latest Korean brightening skincare craze with skincare products that give you a smoother and brighter skin, minus the dark spots caused by sun damage and scarring! De-makeup and reveal radiant and even complexion without a hint of blemish!" 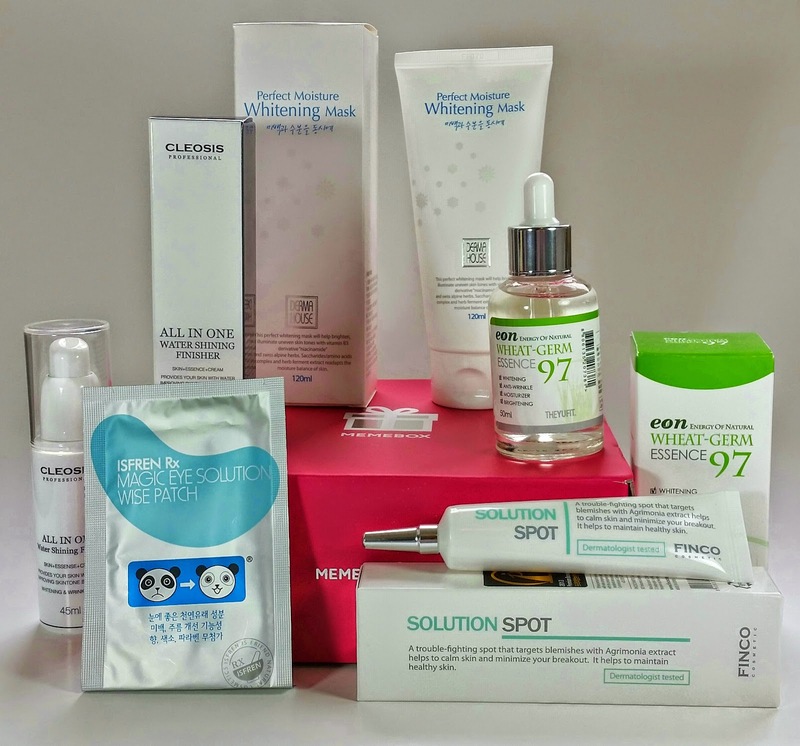 These products all have proven whitening/brightening ingredients in them! I'm happy to see that although it is something that I've come to expect with Korean cosmetics. They mean business with their skincare and they don't want something that *says* its going to work. It is important do have something that *does* actually work. I should mention something, first. Do not be afraid when you see "whitening" as a benefit to a cream, essence or toner. It's quite common in Asian areas to want lighter skin but what it really means is a brighter, more even skin tone. Most whitening products have niacinamide as a main ingredient. Niacinamide is a B vitamin that is proven improve skin's elasticity, help erase discolorations, and revive skin's healthy tone and texture. When I say proven, I mean actual science, not clinical studies put on by cosmetic companies trying to sell their product. One of the great things about niacinamide, is that it works topically! This is kind of a big deal because some things (collagen *cough*) aren't beneficial if you smear them on your skin. Niacinamide has been shown to increase ceramide levels in skin and helps your skin retain water (that's good!). If you are worried about wrinkles or acne scars, you should be making sure that products you use contain niacinamde. It works well for evening out skin tones, reducing acne and the red marks it can leave, as well as age spots on your face, decolletage or hands. Alright! Enough with the awesomeness of Niacinamide and on to the products themselves! 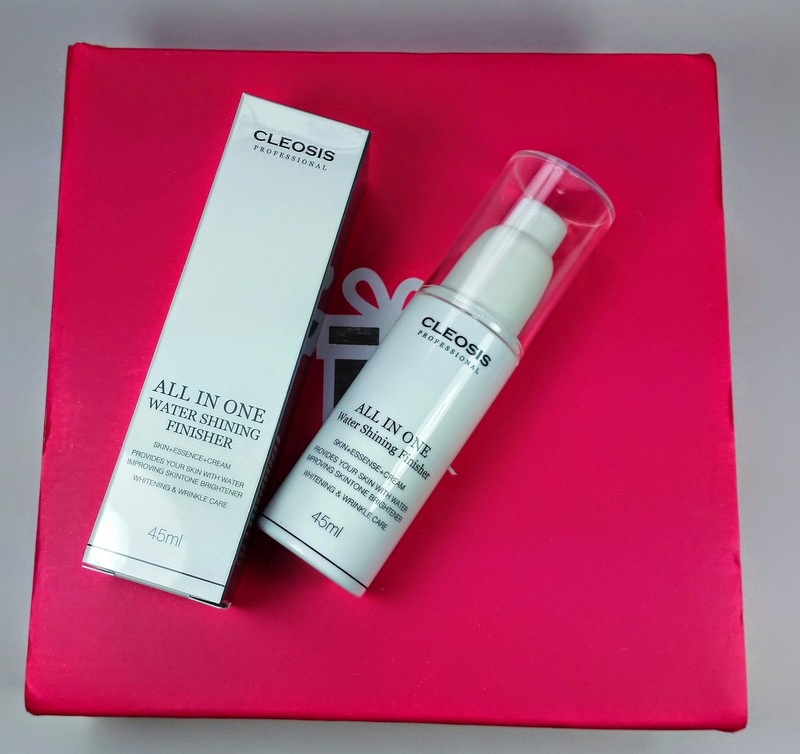 Cleosis All in One Water Shining Finisher-45ml- This is a moisturizing cream/essence that also provides wrinkle care. It's a white cream and smoothes on very nicely. I'm guessing it's called shining because there is a little bit of mica in it, which makes it sparkle. Not a whole lot, though. And my skin feels seriously awesome. I've started with the one item I was the most dubious about. The fifth and sixth ingredients? After the emulsifiers, of course, are sodium hyaluronate and niacinamide. This is a blessing for dry or acne prone skin. It's also got sunscreen in the form of titanium dioxide in it. You should always have a sunscreen on, no matter what your age. I have swapped my dubiousness for happiness because I will absolutely use this product. Cleosis All in One Water Shining Finisher Ingredient List: Water, Butylene Glycol, Glycerin, clycereth-26, sodium hyaluronate, niacinamide, dimethicone/vinyl dimethicone crosspolymer, peg-8, betaine, cetyl ethylhexanoate, squalane, titanium dioxide, bis-peg-18 Methyl ether dimethyl silane, limnanthese alba seed oil, persea gratissima oil, sodium polyacrylate, cyclopentasiloxane, dimethiconol, mica, octyldodeceth-5, octyldodeceth-25, acrylates/c10-30 alkyl acrylate crosspolymer, glycyrrhiza glabra root extract, camellia sinesis leaf extract, lactobacillis/pumpkin ferment extract, galactomyces ferment filtrate, bacillus/bombycis faeces extract ferment filtrate, Cnidium officinale root extract , angelica gigas root extract, perilla frutescens leaf extract, propanediol, curcuma longa root extract, rice ferment filtrate, red ginseng extract, arginine, vitamin e, allantoin, adenosine, panthenol, sodium acrylate, sodium acryloyldimethyl taurate copolymer, isohexadecan, poly sorbate-80, caprylyl clycol, ethylhexylglycerin, tropolone, fragrance. The ingredients are safe according to COSDNA and there are so many good ingredients it would take me awhile to list them all. Let me just note that there is silkworm poop in there. Also, ignore spelling errors. I typed that out by hand. Oof. 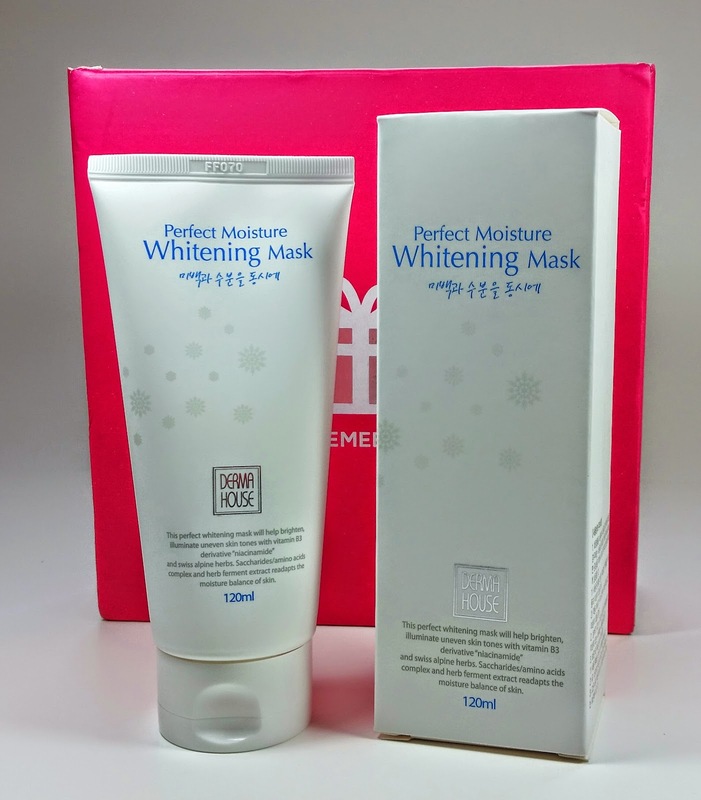 DermaHouse Perfect Moisture Whitening Mask-120ml- This is the one product that didn't have any English ingredient list. It is designed to brighten and illuminate uneven skin tones with Niacinamide (vitamin B3) and swiss alpine herbs, amino acids and herb ferment extracts to balance your skins moisture levels. According to Memebox you can use this two ways: As a wash off mask, spread it on and leave it for fifteen minutes then wash it off. Or as an overnight sleeping pack, smear it on your face as your last step and get in bed. I probably wont try this right now because I have so many cream moisturizers. It's nicely sealed so it should last until I'm ready for it. 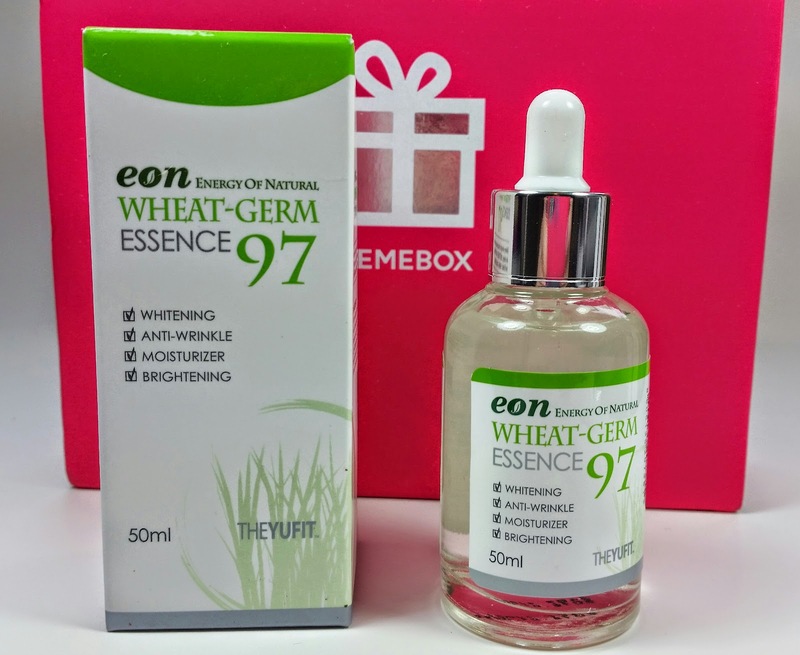 Eon Wheat-Germ Essence 97-50ml- I am excited for this!! I love essences, for one, and I also got the Wheat Germ moisturizer in Global #13 that matches this so I'm excited to see it. This is a whitening, anti-wrinkle, brightening and moisturizing essence. It's what we would consider a serum, I suppose. It's packed with peptides, as well as niacinamide and sodium hyaluronate. The first ingredient is Wheat Sprout Extract and I'm not sure what it exactly does but since Niacinamide is the second ingredient I'm guessing this is going to be awesome! Eon Wheat-Germ Essence 97 Ingredient List: Triticum Vulgare Sprout Extract, Niacinamide, Centella Asiatica Extract, Adenosine, Betaine, tranexamic Acid, sh-polypeptide-1, re-polypeptide-2, sh-oligopeptide-2, sodium hyaluronate, zanthoxylum poperitum Fruit extract, pulsatilla koreana extract, usnea Barbata (lichen) Extract. This essence has some peptides in it that are considered Epidermal Growth Factors (EGF). The plainest way to say it is that they have an ability (supposedly) to help your skin repair itself by producing more collagen and elastin. It's actually kind of exciting and VERY cutting edge. Getting something like this in states is going to cost you an arm and a leg. One more reason Korean cosmetics are so fun to get. 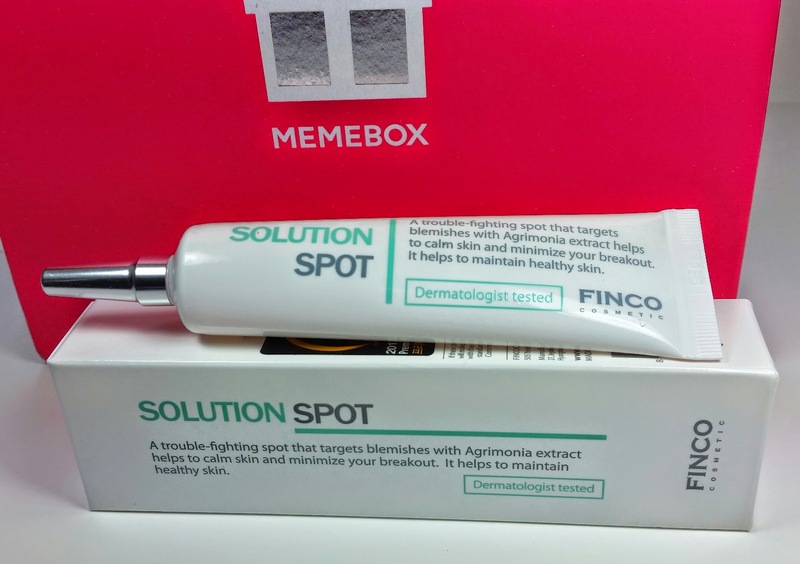 Finco Solution Spot-25ml- This is for targeting red spots, emergency breakouts or unevenly colored spots on your face. It works to soothe and brighten up uneven, reddish spots and acne scars for clearer, smoother skin texture. You can also apply it over make up because it has a transluscent, gel-like finish. I'll be using this! It smells good, too. Niacinamide is near the top of the list then it has some flower extracts. It's got lavender water in it. At least its not the oil or an extract because I want try this! We'll see if I have any kind of reaction to it. Hopefully it's far enough down the list not to matter. 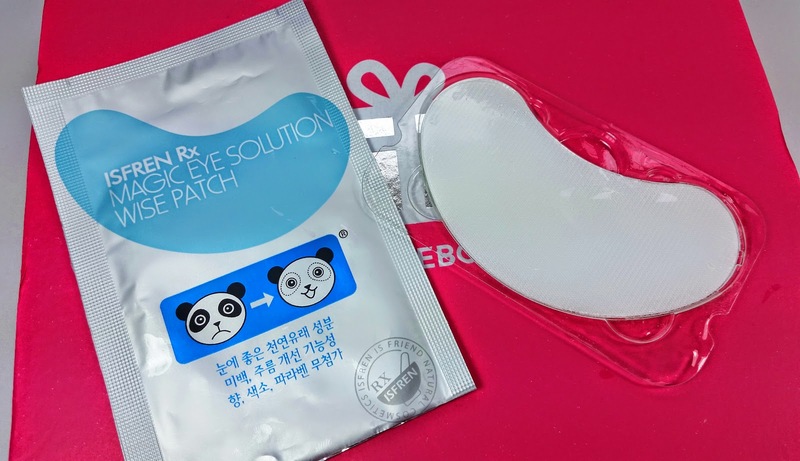 ISPREN Magic Eye Solution Wise Patch- This is a hydro gel patch for under your eyes. It's supposed to hydrate and brighten your under eye area. I opened these and used them. 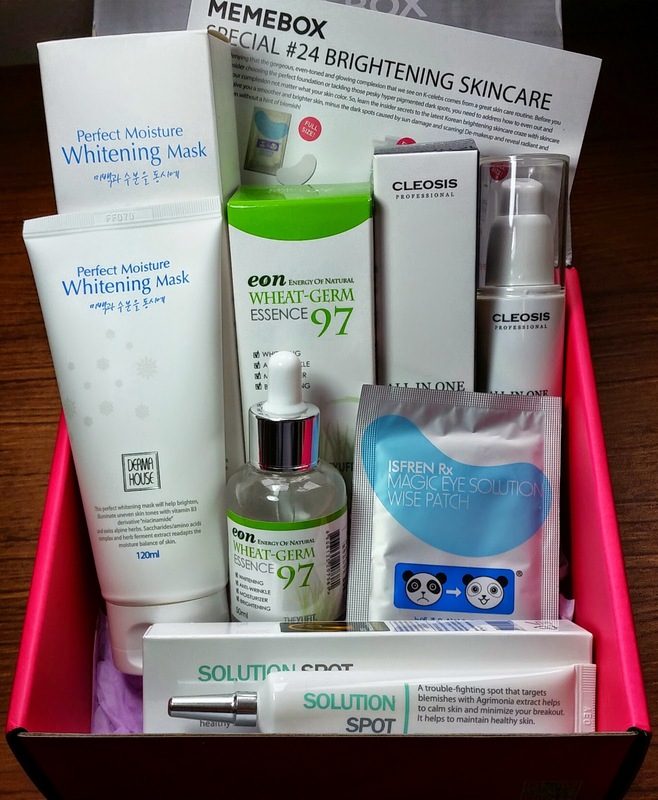 While my dark circles didn't disappear (how could they with only ONE mask in the box!? ), the puffiness was completely gone. VERDICT: Well, this was definitely worth it for me! I really like the products included. Except for the mask they are all full size! There was only really four products since the under eye mask barely counts but since I only paid $4.99 for it I am not complaining about that! Although, even if I'd paid full price, that would make each of these $7.50 (not counting the mask). I would absolutely pay $7.50 for these! Definitely. I'd pay more for the Eon Wheat Germ Essence 97 and the Cleosis (which is $28 regular price). This box delivers what it says it will. Some amazing Brightening products and I'm happy I decided to get this. It's funny how hit or miss these boxes can be but I've received some really good ones lately. I've seen the spoilers for even more of them (omg, the F/W Colors box is amazing!) and they've been good, too! 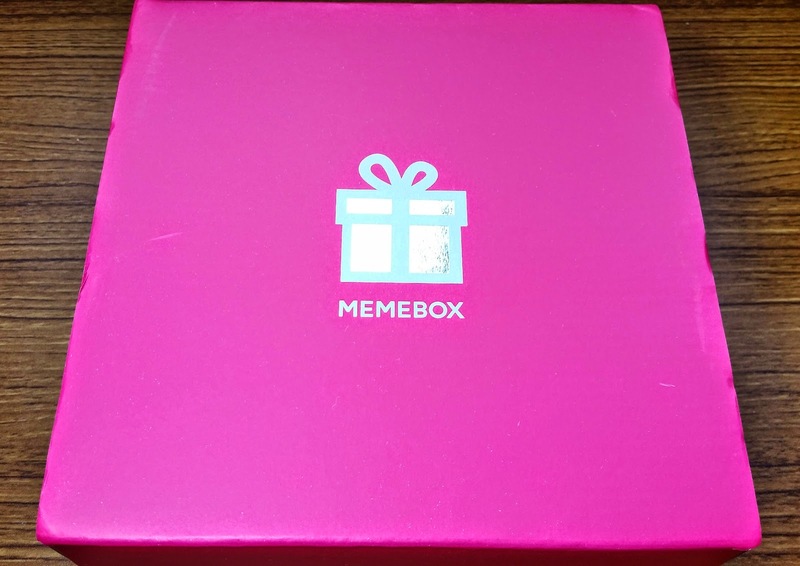 If you would like to see what Memebox currently has on offer, you can check out what they have here. They also have a new box available called Back to School and its full of Hope Girl products. Their lipstick and mascara have been cult favorites and the packaging is pretty cute. 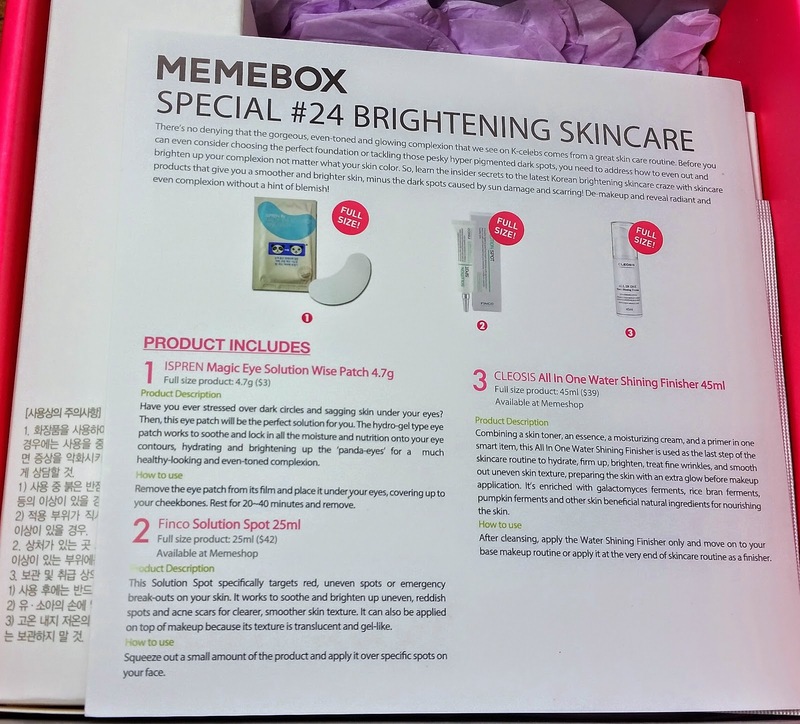 If you're new to Memebox, the best boxes are the Global Memeboxes. I think #17 is still up for purchase. Or a Luckybox, but I think they are sold out right now. My personal favorites (although I haven't received them yet) are the Earth and Sea Cosmetics and the Yogurt Cosmetics boxes. Make sure you use coupons! There's a lot of them to choose from, here are some to get you started but please check my Memebox Deals page for the complete list and for all the secret deals and VIP links! GWFF- $5 off in August! SHIP4CHEAP3- Free standard shipping on one box as long as you are buying two Memeboxes. *affiliate links were used in this post, I'm always thrilled when someone uses them and I will always tell you if I've received something free. I paid for this box with my own money. that's actually one of my favorite boxes ;). Already used mask - it really hydrates, and spot treatment, I think both work. I had terrible breakout and they helped me a lot. I'm also excited to use eon essence but firstly I must finish other products lol. I am afraid of this cleosis product also, mostly because it has hyaluronic acid and apparently my skin doesn't like that ingredient (super wird I know ;D). Have you bought snow white princess box? :) I think it can be similar. Did you use the mask overnight or for 15 minutes? I can't decide how I want to do it :D I have so many products open, too, because I want to try them all but I'm running out of space on my counter so I have to put some away for awhile. I'm sad to hear about the hyaluronic acid! I wonder why it would do that to you? I know we make it naturally in our body but its such a good ingredient, I wish you could use it! At first I used it only for 15 min because I was afraid of breakout, but since my face was pretty amazing after, now I am using it as night cream ^^. My face is super moisturized and soft in the morning, wonder what's inc list for this mask. I also wanted sleeping beauty but I have feeling it will have many products with hyaluronic acid. I am guessing that I can't use products with it because I have problems with thyroid :(. I love your extended tid-bits on the ingredients, so helpful! This looks like a great box, I've heard a lot of really good things about the under eye mask but it's a bummer they only included one set! Yay! I'm glad you like it! It takes me longer to get the review up but some of it is so interesting and good I can't resist. The under eye mask did get rid of my puffiness and they're pretty big so they covered a large part of my cheek as well. The funny thing is that if I touch my skin now, I can tell exactly where the mask were compared to the rest of my skin. So I guess that's a testament to how hydrating they are. I kind of want more now, especially hearing that you've heard good things about them. Thank you so much for another great review!! I'm so excited to receive my box too! :-) All the products look great, especially that mask and the essence! This box is so cool! I'm loving the wheat essence and the cleosis stuff. I don't know what I should think about the silkwurmpoo (it's silky? XD) Great box I love it! what did you think of the eyepads?